Jan Siewert's first game in charge of Premier League bottom club Huddersfield Town ended in defeat, as an early Richarlison goal condemned the Terriers to their 17th defeat of the season at the John Smith's Stadium on Tuesday night. The game saw two teams go head to head with points to prove, after some disappointing recent form. 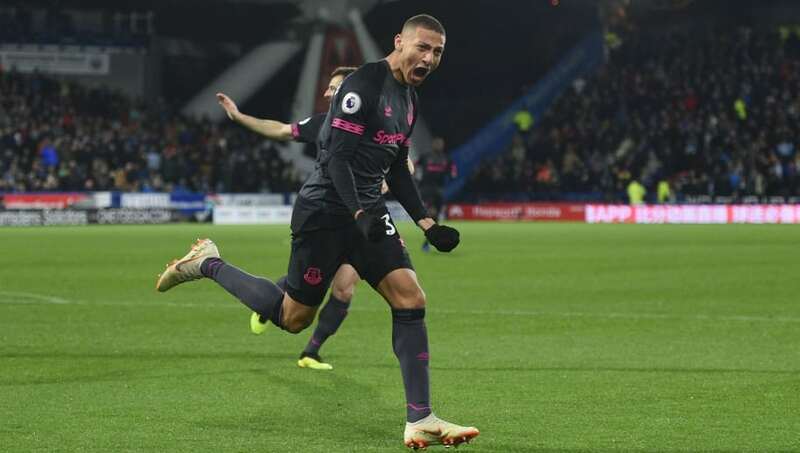 It was Everton though who made the fast start on a freezing cold night in Yorkshire, as Brazilian attacker Richarlison opened the scoring after just two minutes. ​Toffees midfielder Tom Davies cleverly managed to work his way to the byline before cutting the ball back to Richarlison in the Huddersfield penalty area, who hit his close range effort straight at Jonas Lossl, before being allowed another attempt as the ball bounced back to him off the Danish keeper, which the Brazilian duly tapped into the Huddersfield net. The second half began with two early substitutions as injuries forced both sides to change things up. Leighton Baines fell victim to a hip injury and was replaced by Lucas Digne, who was unexpectedly dropped for the game. That came before the hosts' Jonathan Hogg picked up a knock and was replaced by Aaron Mooy, marking his return to action after eight games out injured. It was the Everton substitute however who threw the home side a lifeline, as Terriers attacker Adama Diakhaby was set through on goal, only to be brought down just outside the area by French left back Digne, who had no complaints as Stuart Attwell showed him the red card due to him denying Diakhaby a clear opportunity on Pickford's goal. Huddersfield were able to test Jordan Pickford's concentration with a great chance near the end of the 90 minutes, as Elias Kachunga threatened an equaliser, only for the German's header to be stopped by a terrific save by the England international, diving low to his right. The header proved to be the best chance for a Huddersfield equaliser as the ten men of Everton held on for a confidence boosting win in Yorkshire. Here is our breakdown of this one. The first half showed exactly why Huddersfield are the Premier League's bottom club. A slow start defensively gifted Richarlison two opportunities to give the visitors the lead, which he took at the second attempt. Also the lack of ability and composure was apparent as the Terriers barely threatened Pickford's goal. The second half was a slight improvement, however it is far from enough for Siewert's side to trouble the teams above them. The introduction of Mooy was a powerful one at the John Smith's Stadium. The Australian showed no sign of rustiness as he began to orchestrate the game from the midfield, making Huddersfield a much more dangerous prospect in the second half. He lifted his Huddersfield team mates and also their fans, who were loud throughout but were clearly frustrated by their team's lack of chances. Looked off the pace in the middle of the Huddersfield midfield. Sloppy touches and misdirected passes. The 32-year-old will need to find match sharpness if he is to help Siewart's side miraculously beat the drop. Marco Silva will have been pleased that his side was able to make such a quick start at the John Smith's Stadium, especially after their controversial FA Cup upset away at Millwall on Saturday night. He will be also pleased by the performances of his defence, who were rarely tested but looked sturdy when called upon. The Portuguese will hope his team can start their assault on the top six from here on. Rather strange considering he could have watched most of the game from a TV in the Everton dressing room. Saved Everton when he was called upon, showing superb focus despite his lack of action in the chilly temperatures. The usual first choice left back under Marco Silva lasted 11 minutes at the John Smith's Stadium, as he was found out defensively during his only real test in the game. Allowing Kachunga to race in behind before clipping his heels, bringing the attacker crashing to the turf. Huddersfield Town's Premier League survival bid gets no easier as they face Chelsea next on Saturday at Stamford Bridge in their search for vital points. For Everton, It is a battle of the Portuguese managers as Marco Silva takes on Nuno Espirito Santo and Wolves at Goodison Park on Saturday afternoon.